Cover art courtesy of NASA Johnson Space Center illustrates space manufacturing scenario. Lower left, a mass driver reaction engine is propelling an asteroid into Earth orbit. Lower right, a mining and processing operation has been set in operation on a second asteroid. Upper left, a solar power satellite is under construction, utilizing resources from the nearby asteroid. Upper right, a Bernal shpere space colony houses 10,000 people, many of whom are working as asteroid miners and SPS construction workers. SPS: Near Future Energy Source? 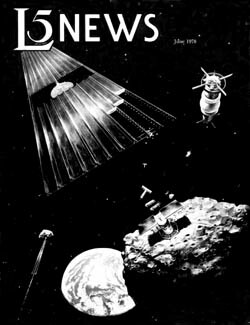 International Astronautical Federation Conference, by Frederick H. Osborn, Jr.